One of my favorite parts about being a book blogger is sharing the books that I love with others. I absolutely love sharing my favorite reads and recommending them to others who are looking to fall in love with a new book! With all of these amazing YA adaptations coming out recently, I know a lot of people are looking for more books similar to the movies that have hit the silver screen, so for all those looking for books similar to your blockbuster favorites, I’ve got some recommendations lined up for you! It’s no doubt that Veronica Roth’s debut novel (and series) DIVERGENT has exploded over the last few years. I absolutely LOVE seeing not only YA novels but any books gain extreme popularity because they start to grab the attention of occasional or non-readers and for some, that starts a craving for more and more books like the one they just read. For me, it was The Hunger Games and that really set off my craving for dystopians which led me to just more books in general. 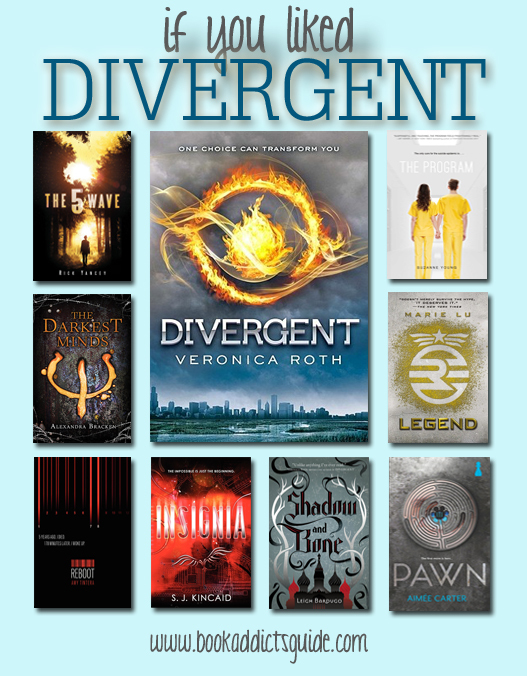 So in this post, I wanted to share my personal picks for books like DIVERGENT. I feel like I see some recommendations that are just thrown together because of genre, and yes — there are plenty of dystopian recommendations here — but I also picked the books I thought had similar themes as well as similar feels. Without further ado, here are my picks for eight books to read after DIVERGENT! Try… THE 5TH WAVE by Rick Yancey. Like DIVERGENT, The 5th Wave is already on its way to becoming a major motion picture. When the book first came out, I wasn’t totally sold on the idea of an alien invasion. I’m not usually one for alien themes but with so many great reviews, I picked up and inhaled it in one day. The action is fantastic, characters are great, and I think fans of Tris will really love Cassie! There’s action, romance, and a plot to save the world. Try… THE DARKEST MINDS by Alexandra Bracken. Things explode in THE DARKEST MINDS when children at 10 years old either develop special abilities… or die. A strange disease sweeps the nation leaving kids dead or left with incredible powers that they can’t control. THE DARKEST MINDS has a bit more of a paranormal aspect with the special abilities thing, but it’s set in a sort of post-apocalyptic world and Ruby and her new group of friends have to try to figure out not only how to survive but also thwart the authorities. All three books in this trilogy are now out and this is one I want to finish this year too! Try… REBOOT by Amy Tintera. I really loved REBOOT when I read it. It’s a sort of zombie story without it really being about zombies. Wren is a “reboot” — After 178 minutes of being dead, she came back to life. She’s not as emotional and seems less human than the reboots who have been dead for longer and come back but emotion isn’t very necessary when your job is to train other reboots… until she starts to fall in love. REBOOT has romance, action, and is set in a dystopian Texas. I thought it was a great balance of everything! It’s a two book series too so it’s one you can finish quickly! Try… INSIGNIA by S.J. Kincaid. INSIGNIA is also a trilogy but it’s a bit different than the ones I’ve listed so far — the main character is male and also a bit younger at fourteen, but the book doesn’t feel juvenile. The earth is in the middle of WWIII when Tom Raines, a fourteen-year-old with incredible video gaming skills, is recruited by the army to control drones. It’s definitely not the same exact concept as DIVERGENT but I think fans will enjoy it! It has a similar feel to me and it’s something that will be easy to sort of compare but won’t feel exactly the same. I had so much fun reading the first book! Another series I want to finish soon. Try… SHADOW AND BONE by Leigh Bardugo. SHADOW AND BONE is actually fantasy, not dystopian, but I also think it’s great for DIVERGENT fans! The lead female Alina feels she’s completely ordinary and then it turns out that she’s actually incredibly important with incredible abilities. If you’re not a fantasy fan (yet), I strongly recommend starting with SHADOW AND BONE! It was one of my first fantasy series and I ended up really loving it to the point where this trilogy has become one of my all-time favorites. There’s plenty of action, adventure, romance, villains, and magical powers to go around! Try… PAWN by Aimee Carter. Another dystopian novel is PAWN by Aimee Carter. This one has a similar feel to DIVERGENT’s factions with its sort caste system determined with a number ranking. Usually people test into their rankings and don’t get to change at all but Kitty is offered an unusual opportunity to live a glamorous life, but she has to give up everything of her own life. It’s a very interesting situation and I really enjoyed PAWN a lot! It was definitely twisty and kept me hooked. Try… LEGEND by Marie Lu. I’ll admit it… I actually liked LEGEND more than DIVERGENT! I was totally wowed by this new dystopian series (well, it’s not new anymore. All three books are out now!) with alternating point of views between the two main characters, Day and June. They’re pretty much polar opposites with June scoring the highest ever on a series of tests called The Trial and Day has the lowest score ever. Worlds collide when Day and June have their first encounter under terrible circumstances and the book escalates from there. I just absolutely loved it! Try… THE PROGRAM by Suzanne Young. I have to say, I was very pleasantly surprised by THE PROGRAM! This dystopian world is much different than DIVERGENT but I think the general concept will really resonate with DIVERGENT fans! Sloane lives in a world where suicide is an epidemic so Sloane makes the decision to hide the fact that her feelings are there. She doesn’t want to through “the program” and come back emotionless and wiped of all intense memories. It was such an interesting concept and I really connected a lot with this book and its characters! I hope this list helped you pick out a few new reads! I don’t take my recommendations lightly so I really hope these recommendations strike a chord with DIVERGENT fans! If you’ve read any of these already, what do you think? What other books would you recommend? Looking for more recommendations? Check out my previous list of recs below! If You Liked… If I Stay: For fans of IF I STAY, here are a few hand-picked selections of books you should read next! If You Liked… The Fault in Our Stars: With so many great YA adaptations hitting the big screen, I wanted to make a lovely graphic of suggestions for people who have enjoyed them! This one kicks off the series with recs for THE FAULT IN OUR STARS fans! The Book Addict’s “GUIDE” to Male POVs: A list of recommendations for mostly young adult books and some adult, all from a male point of view or alternating male/female POV! The Book Addict’s “GUIDE” to “Crossover” Books: Know adult readers who want to get into YA? Or YA readers who want to pick up new adult reads? Check out this guide to “crossover” books! The Book Addict’s GUIDE to paranormal, sci-fi, and fantasy: The second in my series of guides! I hard a hard time separating these three so they all got smushed together. The Book Addict’s GUIDE to contemporary: First of many to come! I created a road map/choose your own adventure-style guide to YA contemporary romances. If you’re looking for a good contemp read, start here! This entry was posted in Books, Dystopian, YA and tagged Adaptation, Book to Movie, Books, Divergent, Dystopian, If You Like..., Recommendations, Veronica Roth, YA, Young Adult on January 2, 2015 by Brittany. I second Insignia and Legend! I gave my little brother Insignia to read and he loved it even though he isn’t much of a reader. Great recs! Shadow and Bone is perfect for this list! Such a good book. I may have even liked it more than Divergent! Shadow and Bone is on my TBR list for year. I found a super cheap copy at the local used bookstore while holiday shopping. I was not a fan of The 5th Wave, Brittany. Ug. So overhyped. It was my worst read of 2013. Not gonna lie, I was squealing when I saw this post title. I read Divergent in 2012 and it was seriously lifechanging. it’s actually what got me into blogging! These are all great recs! I am so happy I gave The 5th Wave a try! I shy away from alien books but I absolutely loved this one! Love your Guides and Recs Brittany!! I am someone who loved the first two books in the divergent series but really couldn’t get to liking the last one. But either way, I noticed all except three of these books were on my TBR! I hadn’t heard of Reboot and Insgina before. And I am not sure about The Darkest Minds yet! You give such great recs! I haven’t read MOST of these, I have a lot of catching up to do hehe. Thanks for the tip on the Legend series. LOVED it! Love this post! The 5th Wave is one of my all-time favorite books, and I really enjoyed The Darkest Minds. You should try “The Testing” series. it is much like Divergent and the Hunger Games! . I am hoping I stumbled onto a good list. My daughter read all of the Divergent series and loves them. She is 12 and reads at a high level academically. It is difficult to find books at her reading level that are not above her maturity level. Please let me know if you have any more that might interest her. BTW – I tried to get her into the Hunger Games and she was not interested. Hi Theresa! Thanks for checking out the post!! I would also recommend The Giver Quartet and The City of Ember. One of my favorite series is The Lunar Chronicles by Marissa Meyer (the first book is called Cinder) that I think could possibly be a good fit for your daughter! I wouldn’t say they’re similar to Divergent but as far as topic goes (they’re actually sci-fi adaptations of classic fairy tales! Cinder is a retelling of Cinderella) but the books are quite popular (I personally love them!) and I think they’d be an appropriate reading level! Thanks for the list ! can any body tell me how many part of Divergent series? ??? Thanks so much!! !